These brief histories of the Aboriginal Americas reveal that categorization is complicated. Take language, for example, which is often used as a key element of nationality (e.g., French people speak French and live in France and almost everyone in France speaks French). 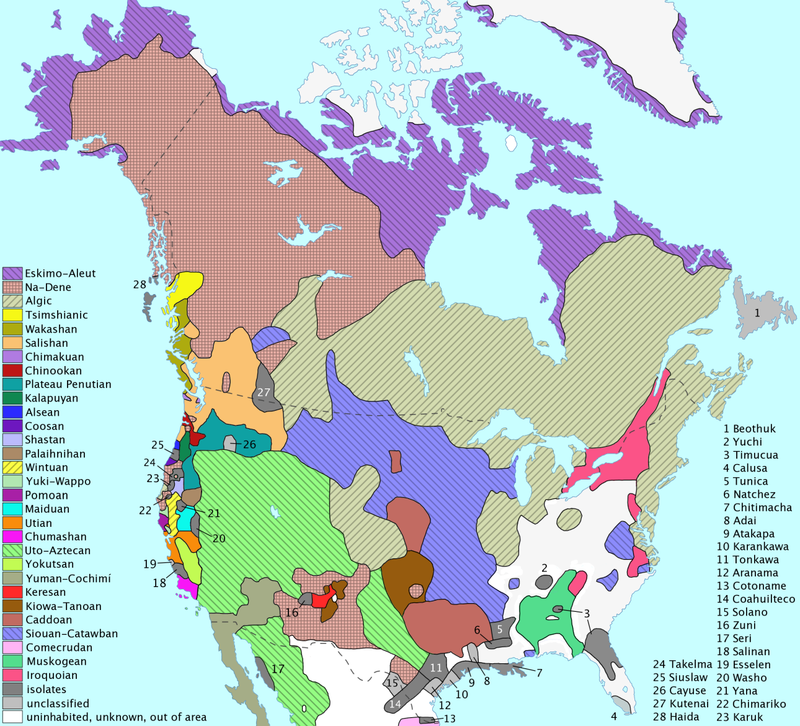 For Aboriginal peoples, there are no political units that encapsulate the whole of the largest and most widespread language groups in Canada. 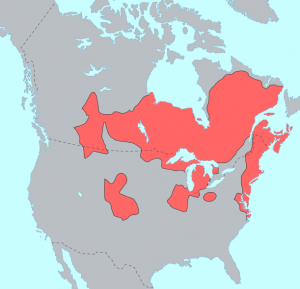 As the maps in Figures 2.12 and 2.13 show, the two most widely spoken language groups before contact — Athabascan or Na-Dené and Algonquian — cover massive areas and include societies that were separated by huge distances. 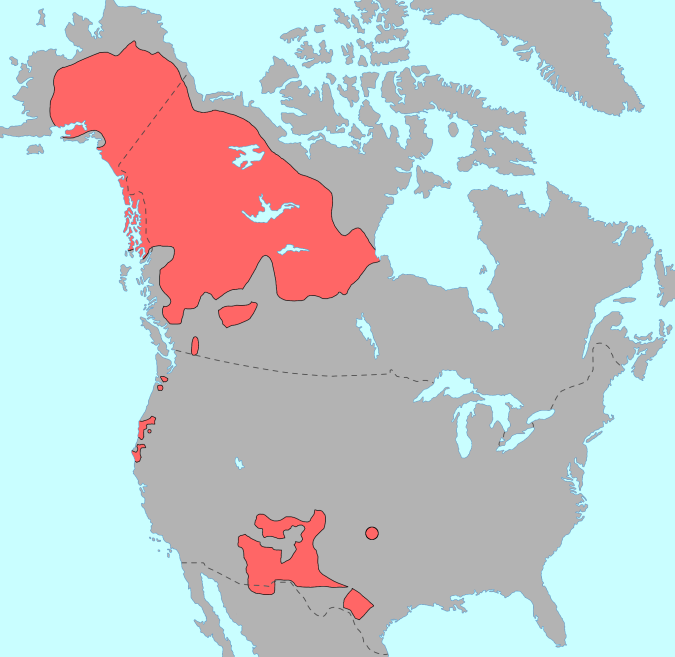 Na-Dené dialects are spoken by Apache and Navajo in the American southwest, as well as by peoples from Alaska’s Tlingit to Alberta’s Tsuu T’ina (or Sarcee) who migrated south onto the Plains in the early 1700s. Similarly the Algonquian-speakers are represented by agricultural societies, bison hunters like the Siksika (Blackfoot), and lowland fisher-hunter peoples like the Cree, the Mi’kmaq, and the Anishinaabe, as well as large populations (some of them agriculturalists) in what is now the United States. Within these two language areas, dialect differences can be very great, but the core elements of the language mostly survive. Figure 2.14 Pre-contact distribution of Aboriginal language families. One of the challenges facing anyone interested in Aboriginal language groups is that European contact was a catalyst for migration, generally in a westward direction. European observers were, thus, recording the presence of language groups whose more recent homelands in some cases were somewhere else. 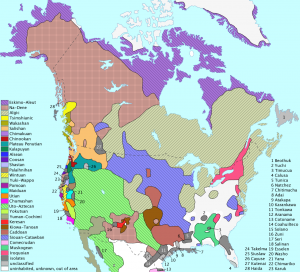 Figure 2.14 gives a sense of the huge diversity of language groups in North America but no sense at all of the internal diversity within the broad linguistic categories. Agriculture, horticulture, foraging, hunting, and fishing were key features of the economies of the pre-contact Americas. In Canada, rocky, stingy, or hard-packed soils (like those on the Prairies) made agriculture all but impossible (as did, of course, the climate in many zones). Despite some mastery in metalwork, as evidenced in silver, gold, and copper decorative arts, the knowledge and skills necessary to produce iron tools that would give agriculture a lift were not available. “Digging sticks” used to drill seed holes are far more labour intensive but less demanding on the soil than wooden or metal ploughs. This is not to say that agriculture is the higher form of economic activity in a pre-industrial world. Farming societies have many advantages, such as the ability to achieve rapid and substantial growth, the wherewithal to build villages and armies, political sophistication of a particular kind, and so on. But they also have significant health issues, less flexibility in the event of famine or drought, and are at more risk of being attacked by enemies. The Aboriginal economies were far more adaptable in this respect than their Old World contemporaries. Figure 2.15 Copper was widely worked and used in pre-contact North America. On the northwest coast it was fashioned into large and beautifully-finished shields, symbolic of wealth and authority. 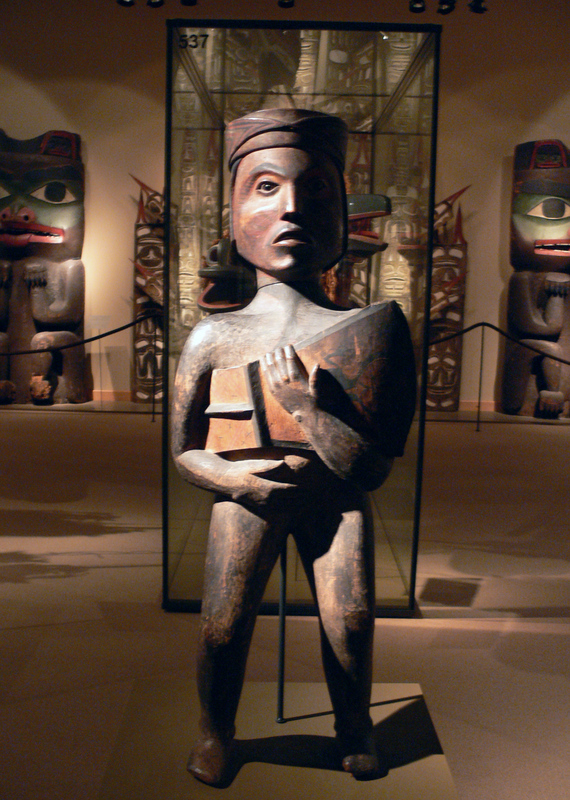 This Kwakwaka’wakw figure, carrying “a copper,” was carved before the 1880s and is housed at the Ethnological Museum in Berlin. What is more, everyone participated in commerce. These were trading societies that augmented their output with goods from their neighbours. Sometimes these were raw materials, such as furs or maize, flint or wampum; other times they were crafted goods like clothing, hides, or the much-sought-after sinew-backed bows made by the Shoshone. Everywhere one looks, the archaeological evidence turns up exotic artifacts in village sites, indicating a rich intercommunity and intercultural life that dates back thousands of years. For example, red ochre suitable for rock painting and other uses as a dye was mined for centuries from caves in the Similkameen Valley in southern British Columbia; it shows up in pictographs as far afield as Arizona. In Vancouver’s Stanley Park there is a clutch of totem poles arranged near the old cricket oval on Brockton Point. It is a favourite spot for tourists to stop for photographs. The display became much more complex and informative in preparation for the 2010 Winter Olympics. However, a long-standing complaint was that the poles were not examples of local, Coast Salish work, but rather, northern Kwakwawa’wakw and Tsimshian styles. In other words, the people who used to live on Brockton Point (and whose graveyards remain nearby) were excluded from this display of “native” history. Given the fragmentary nature of the evidence, even semi-accurate pre-Columbian population figures are impossible to obtain for the indigenous populations prior to colonization. Estimates are extrapolated from small bits of data. Recent research suggests that the 13th century marked a critical break in the demographic history of North America. As the climate changed for the worse and the little ice age began, populations struggled to survive famine and competition for resources intensified. It has been suggested that peak pre-contact population numbers may have occurred two or three centuries before contact. In 1976, geographer William Denevan used the existing estimates to derive a “consensus count” of about 54 million people for the Americas as a whole. There is, however, no “consensus.” Estimates for North America range from a low of 2.1 million (Ubelaker 1976) to 7 million people (Thornton 1987) and even to a high of 18 million (Dobyns 1983). The Aboriginal population of Canada during the late 15th century is estimated to have been between 200,000 and 2 million, with a figure of 500,000 currently accepted widely. These numbers are utterly conditional: on the West Coast alone estimates range from 80,000 (ca. 1780) to 1.6 million, although the evidence to support either the low count or the high count is sparse. Nonetheless, if the widely touted figure of 350,000 for British Columbia is reckoned as fair, then the national figures would jump up by as much as 200,000 (a 40% increase on the widely accepted figure of half a million)! Thus, there are significant discrepancies. As we shall see in Chapter 5, the contact experience brought with it terrible disease epidemics that raced ahead of the Europeans in the proto-contact period. It is important to note here that the work of historians, anthropologists, archaeologists, and others — often supported by oral testimony from Aboriginal sources — suggests that the pre-contact Americas were not disease-free. Contagious diseases included tuberculosis, hepatitis, and respiratory infections. Syphilis and gastrointestinal illnesses might also belong to this list. And there were, in parts of the Americas, significant numbers of parasites. With the exception of tuberculosis, however, none of these are proper epidemic diseases. Syphilis, for example, spreads only on a one-to-one basis through intimate contact between individuals; influenza, by contrast, can be transmitted by one infected individual to dozens of other hosts at a time by the simple means of coughing. For the most part, then, experience with epidemics was both limited and very different from what Asians, Africans, and European humans witnessed regularly. This lack of knowledge meant that Aboriginal societies were badly unprepared for highly contagious disease epidemics. It does not mean, however, that Aboriginal life expectancies were particularly good. All indications suggest that, as in most human societies, a person was lucky to reach 30 years of age and very fortunate to reach 50. If infant mortality levels were higher in the Americas (and evidence suggests they were) it wasn’t helped by extended breastfeeding practices. Probably in most Aboriginal societies, infants were nursed for four years. This custom has an effect beyond nourishment and hydration: prolonged breastfeeding reduces fertility. Fewer infants may have generated more intensive childcare overall but, obviously, dampened fertility rates placed an upward limit on population growth rates. This would prove a critical weakness when it came time to recover from epidemic depopulations. Aboriginal societies at contact defy simple categorization by language, economic activity, or location. Population estimates suggest that humans were very numerous in the Americas in the late 1400s but perhaps not as numerous as they were a few hundred years earlier. Na-Dene langs by ish ishwar is used under a CC-BY 2.0 license. Algonquian langs by ish ishwar is used under a CC-BY 2.0 license. Langs N.Amer fr by ish ishwar is used under a CC-BY 2.0 license. Kwakiutl chief by FA2010 is in the public domain. 2.5 Languages, Cultures, Economies by John Douglas Belshaw is licensed under a Creative Commons Attribution-NonCommercial-ShareAlike 4.0 International License, except where otherwise noted.